"Woyzeck, you always have that hunted look in your eye. A good man doesn't have that." It's hard to believe that Georg Buechner's play Woyzeck was written in about 1836; it seems almost as if it were something Franz Kafka would have written in the 1920s. It was perfectly fitted to be transformed into the opera Wozzeck by Alben Berg during that time period. The cruelty and nonsensical nature of the many afflictions poured upon Franz Woyzeck's head seem so twentieth century that it hardly appears possible that the play could have been written nearly a century earlier. Klaus Kinski carries the show with his portrayal of the twitching, driven-to-madness Private Woyzeck. From the very credits, we see him alone, being abused, beaten and kicked by his commanding officer. In the very next scene, Woyzeck is shaving his captain with a straight razor while the verbal abuse continues; the captain drops hints that Woyzeck's wife Marie (Eva Mattes) is being unfaithful to him. While out cutting brush, Woyzeck begins hearing spirits; he then appears in the office of a doctor (Willy Semmelrogge), first being chastised for urinating against a wall and then being ordered to eat nothing but peas, in some sort of bizarre medical experiment. Woyzeck's senses are heightened to the point of madness as he suspects and then confirms Marie's infidelity. The whole collapses in a scene of insanity and mayhem (mostly offscreen). Kinski's performance digs down into the deepest depths of suspicion, lunacy and nervous tension; he has a hunted look, as the captain notes during the shave. With a nearly-shaven head and gaunt features he looks like a concentration camp inmate. But Kinski doesn't rave or act overtly crazy as a lesser actor might have done; so much of his acting here is internalized that one feels that he is at all times a powderkeg ready to explode. According to the production notes, Kinski had refused to play the role on stage years earlier, fearing it would indeed drive him personally over the edge of madness; we can see him flirting with the brink here so convincingly that his decision was probably a wise one. Eva Torres also turns in a good performance as the unfaithful wife Marie, easily flitting from deception of Woyzeck to teasing and passion with her lover (Josef Bierbichler), a drum major for a military band. It's no wonder poor Woyzeck goes mad; the script is full of references to knives, razors, cutting and death, even in the most innocent of circumstances. The result is as if all of the people whom Woyzeck interacts with are in a grand conspiracy to drive him beyond the boundaries of sanity. The original play is often seen as an early forerunner of German Expressionism; it can also be seen as an existential tragedy as Woyzeck attempts to give some meaning to his mad existence. 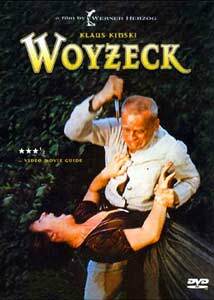 Woyzeck is filmed in a matter-of-fact, almost documentary style. Herzog's camera doesn't intrude into the action, but remains a distant observer. This causes the viewer to become complicitous in the conspiracy, much like the experimenting doctor, or the pawnbroker who comments, upon selling Woyzeck the fatal knife, "Death should be cheap, but not free." Shot in just eighteen days, immediately after the completion of Nosferatu (1979), this one of numerous collaborations between Kinski and director Werner Herzog is a fine study of madness, equal to their Aguirre and Fitzcarraldo. Image Transfer Review: The anamorphic picture is generally good, although a bit lacking in sharpness and definition. Colors are reproduced faithfully, although Herzog uses an extremely limited palette; only Marie's lover wears bright colors and these come through quite nicely. Shadow detail is excellent, as are the blacks. At the beginning of chapter 6, there is a nasty flicker; considering the otherwise flawless nature of the source materials, this may be a problem with the original film. Audio Transfer Review: The original German mono track is included, and it has minimal noise, and some slight hiss. The music, mostly supplied by a highly dissonant chamber group, is on occasion distorted but this appears to be intentional on Herzog's part. It gives a supporting feeling of edginess and cruelty to the film that highlights the "hunted look" of Woyzeck. Extras Review: Removable English subtitles are provided, as is a 1.66:1 trailer from the German release (with optional subtitles). Lengthy talent bios are provided for both Herzog and Kinski; these also include selected filmographies for both men. Although Herzog's appears fairly complete, Kinski's can only hint at the 250+ films he starred in during his career. Chaptering is quite good for a fairly short film. Brief production notes are included on the paper insert of the keepcase. A grueling and forceful essay into madness, infidelity and conspiracy, Woyzeck is an important and overlooked work in the Herzog-Kinski canon. Recommended for those looking for a serious, almost existential, drama.